Batteries contain toxic and corrosive substances. If batteries are swallowed, it can result in severe health problems. There is a risk of fatal injury. Keep batteries out of the reach of children. If a battery is swallowed, seek medical attention immediately. 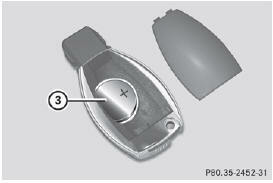 The SmartKey batteries contain perchlorate material, which may require special handling and regard for the environment. National guidelines must be observed during disposal. In California, see www.dtsc.ca.gov/ HazardousWaste/Perchlorate/ index.cfm. Mercedes-Benz recommends that you have the batteries replaced at a qualified specialist workshop. The battery is working properly if battery check lamp 1 lights up briefly. If battery check lamp 1 does not light up during the test, the battery is discharged. ► Change the battery . You can get a battery in any qualified specialist workshop. Have the batteries replaced at a qualified specialist workshop. You require a CR 2025 3 V cell battery. 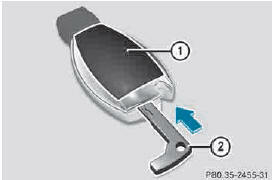 ► Press mechanical key 2 into the opening in the SmartKey in the direction of the arrow until battery tray cover 1 opens. Do not hold the cover closed while doing so. ► Remove battery tray cover 1. ► Repeatedly tap the SmartKey against your palm until battery 3 falls out. ► Insert the new battery with the positive terminal facing upwards. Use a lint-free cloth to do so. ► Make sure that the surface of the battery is free from lint, grease and all other forms of contamination. ► Insert the front tabs of battery tray cover 1 and then press to close it. 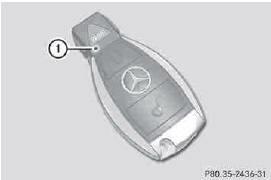 ► Check the function of all SmartKey buttons on the vehicle.